When rains slowed enough for people living in the central coast of Vietnam to venture outside and assess the damage, they were stunned at what they saw. In the night, Typhoon Ketsana had unleashed thousands of logs and cut timber, which had ridden the swollen rivers down the mountains, bashing anything and everything in the way. The lumber, much of which is believed to have been illegally harvested old-growth timber, clogged rivers and jammed under bridges and piers. For residents in the area who managed to harvest the wood, the rains last month brought riches. But Typhoon Ketsana also exposed the heavy human toll being taken on the land upriver. All that wood and lumber was an unusual sight, concedes Pham Thanh Lam, director of the Forestry Protection Bureau in Quang Nam, the province where the typhoon made landfall on Sept. 29. 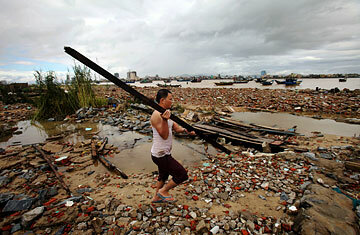 The storm was one of the most powerful to hit Vietnam in the past 50 years, killing at least 164 people. The highest number of deaths occurred in the mountainous province of Kon Tum, after heavy rains triggered flash flooding and landslides. At least two villages were completely buried. The washed-up wood, says Lam, is evidence of the shrinking old-growth forest cover  a loss that has contributed to erosion and frequent flooding in the province. He blames "logging pirates," illegal timber smugglers who are becoming increasingly bold  and even dangerous. But, Lam added, many trees are also being felled legally to make way for hydroelectric plants and resettlement projects up in the mountains. This week, the Forestry Protection Department at the Ministry of Agriculture and Rural Development ordered the provinces to determine how much of the wood washed downriver by Ketsana was illegally cut and how much of it was harvested from legal sources. In theory, each piece of legally cut old-growth timber should have a stamp of the forestry department. But finding those logs is going to be difficult now that some of the wood is already on its way to becoming tables and chairs destined for foreign markets. It was a free-for-all, says Do Van Dong, who lives not far from the Vu Gia river in Quang Nam. Thousands of residents converged on the logjam at the Quang Hue bridge, he says. Despite the churning currents, people waded in to salvage the wood. Groups of men carried trees into town and sold them that same day. "Some even brought power saws to the site and cut the logs into timber like a carpenter's shop, selling it on the spot," says Dong. "There were so many people that the police and forest rangers couldn't stop them." Nor does it seem that Vietnam can stem the larger problem of illegal logging. Its park rangers are ill-equipped and too few in number to adequately patrol protected forests. A report issued by the Ministry of Agriculture and Rural Development in August cited hundreds of attacks on rangers during a five-month period in 2009, resulting in 14 serious injuries. Illegal loggers and animal poachers have tried to run over officials with their vehicles, according to the report, and attack rangers with syringes. Lax management and local authorities colluding with loggers were partly to blame for the illegal logging of 3,200 acres (1,300 hectares) in the first half of 2009. But timber is big business in Vietnam, where demand for exotic wood products in Europe and the U.S. has been driving illegal logging for years. Furniture manufacturing and wood processing earned Vietnam $2.8 billion last year, making it one of the largest hard-currency earners in the country. Loggers have become so brazen that they are even going after the rare Dalbergia tonkinesis trees planted on the streets of Vietnam's capital, chopping them down in the middle of the night and selling them to traders. Though less than 1% of Vietnam's primary or old-growth forest remains, overall, forest cover is actually on the increase. Vietnam's central government has been pursuing an aggressive national planting program to boost tree cover to 43%, up from a low of 28% two decades ago, says Dao Xuan Lai, head of the U.N. Development Program's Sustainable Development office in Hanoi. Unfortunately, many of the reforested areas are replanted with fruit orchards or fast-growing trees for the pulp and paper industry. "Of course they need to do more," says Lai. "The political will is there, but the problem is implementation at the local level." Millions of people live on these lands and earn their livelihoods from the forest. It's always a challenge to pursue policies that allow local communities to live in the protected areas but also maintain the habitats. Other countries in Asia are trying to do this, he says, but Vietnam is actually faring better than most. The forestry department has asked for an additional $5.8 million in order to recruit and train 3,000 rangers to patrol protected lands. Even if they get the extra funding, for many of the forests in Vietnam's central highlands, and for the people whose villages now lie under a sea of mud, Typhoon Ketsana has revealed that the help will come too late. See pictures of forest defenders in the U.S.